Great British beef produced from native Aberdeen Angus cattle. Aberdeen Angus beef characteristically has a fine marbling of cream fat running through the meat, this results in succulent tender and richly flavoured beef. Collagen/meat protein ratio under 12%. Percentage of fat content under 5%. Pan Fry. Time: 24-26 mins. Remove all packaging. …Place the mince in a frying pan and cook for 4-6 minutes until browned. Add choice of sauce or stock, bring to the boil, reduce heat and simmer gently for the remaining time, stirring occasionally, until thoroughly cooked. 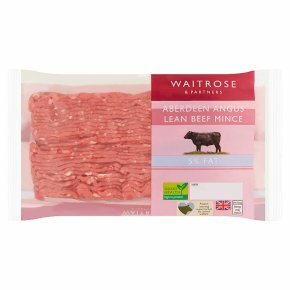 We recommend that all minced beef should be cooked thoroughly until the juice runs clear and there is no pink meat.